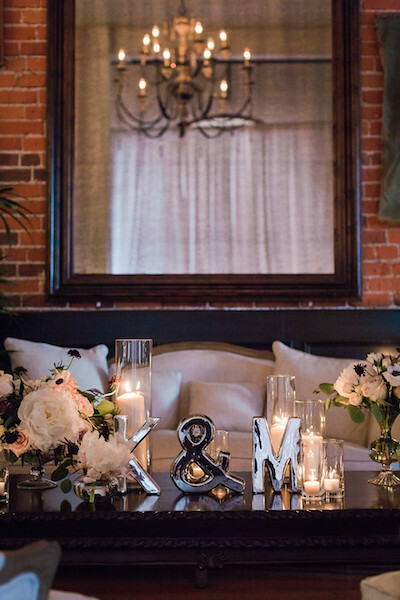 Never have we ever seen a wedding so intimate, romantic, modern, and simultaneously classic! Martin and Kate's wedding at the famous Carondelet House in Los Angeles still makes us swoon, and we know you'll love it as well. Our goal for this event? To create an environment that perfectly captured all that a wedding should: dramatic, but warm; lavish, but intimate; timeless, but modern. The color palette featured tons of moody mauves, dusty blushes, deep berries, and muted greys. We then worked hard to combine raw elements with modern to create a wedding as unique and beautiful as the bride and groom. 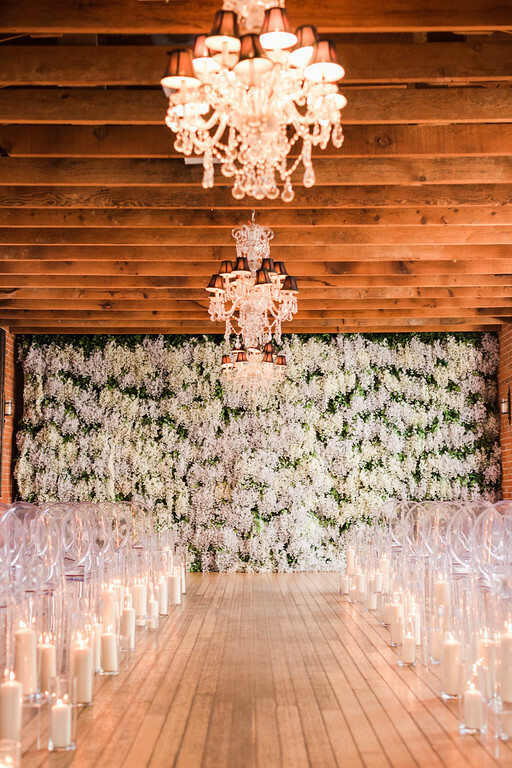 Now about this ceremony...we created the most romantic and dramatic floral wall of all time! We took thousands of bunches of wisteria and completely covered the brick wall that would stand behind the altar. We took a collection of ivory pillar candles and lined them on both sides of the aisle. Guests then sat in flawless clear ghost chairs and watched the magic that was this ceremony unfold! Kate's bouquet was absolutely stunning with a round shape and relatively loose overall texture that provided for a lot of subtle movement and depth. We used mostly white florals with small additions of mauve and berry seasonal accents. All of this was then delicately tied together with a dove grey velvet ribbon. 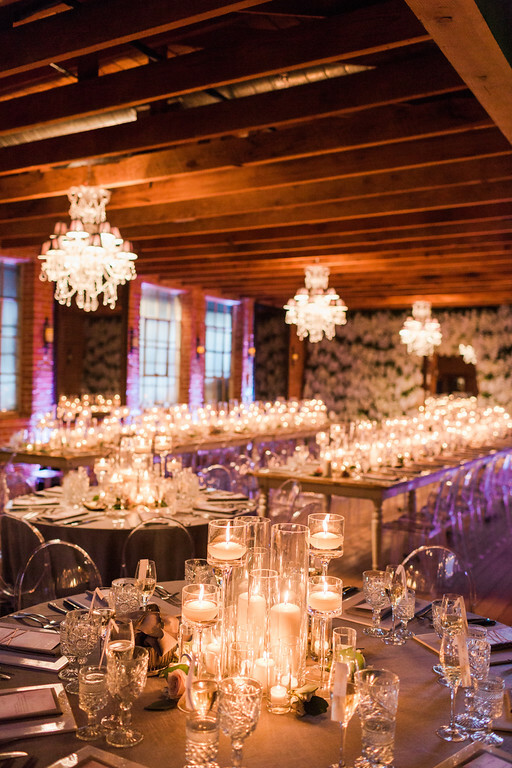 After a brief cocktail hour, guests returned to an entirely repurposed reception.The Carondelet House brought in their 23' wood tables, where we then placed a collection of ivory pillar candles in various sized glass cylinders. Along with the pillars we mixed in hundreds of five inch candle sleeves and footed votives with floating candles. Flawless ghost chairs marvelously brought a modern feel to the otherwise very warm and raw farm tables. Our marble chargers with mauve satin ribbon accents then sat delicately in front of the guests. Now apart from the gorgeous signage from Emily Devitt Designs, this area wouldn't have been the same without all of that elevation! 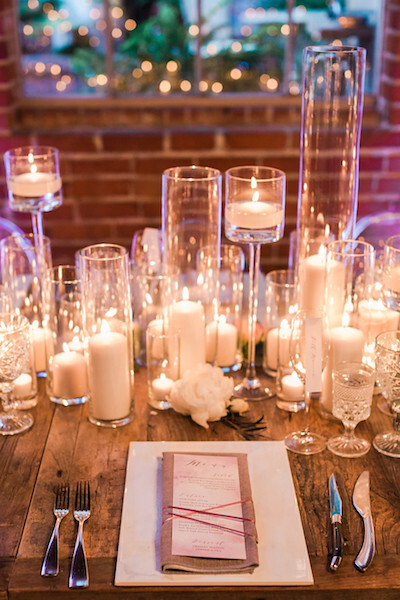 Multi leveled lucite platforms created gorgeous elevation of petite blooms and candles. 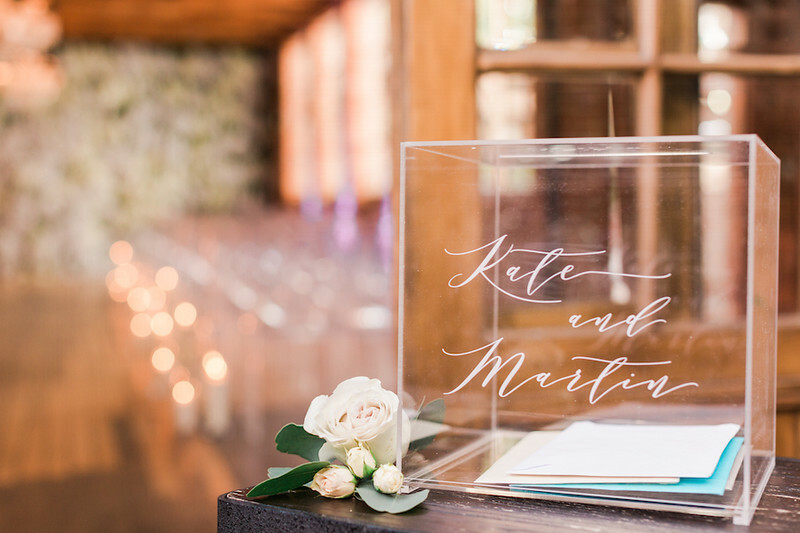 Congrats to Martin and Kate for having one of the most gorgeous weddings of all time!